After paddling the Ranger 14 for a few months since converting it for solo paddling, I was not happy with the handling. Head winds and cross winds made the boat particularly hard work. Ok, a polyethylene Ranger 14 is never going to perform like a thoroughbred but it had to be better than this with a little work! The simple expedient of converting the Ranger 14 for solo paddling by replacing the bow seat with a thwart and turning the stern seat and seast hangers around to face the opposite direction was just too easy to be successful, the seat was too far back and needed to be moved forward in order to trim the boat. At 14', the Ranger is a short boat and sometimes needs as much waterline length as possible. Back to the ever-helpful Dave Crooks at Endless River with the credit card! Dave stocks several seat options for Venture Canoes. 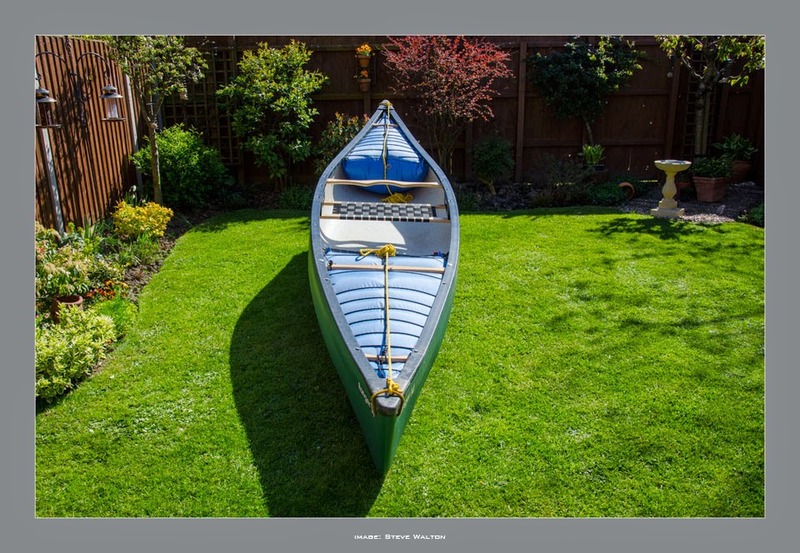 All seat sizes are the same frame width and will fit the standard metal Venture Canoes seat hangers, so it is just a case of choosing a suitable seat width. The seat width refers to the webbing area (not the overall width of the seat frame) and I chose the extra wide size to bring the webbing as close as possible to the seat hangers. The Ranger 14 needs quite a bit of heeling-over to maintain the waterline length on longer, slower and flatter sections of rivers, especially in those breezy conditions and the extra-wide seat is perfectly sized to allow a good degree of leaning. The extra wide seat costs a total of £57 including delivery and arrived by courier the following day. Faultless service as usual from Endless River! As supplied, it is around 40" long and needs to be cut down to around 35.250" on the forward edge and 34.750" on the rear edge of the frame to accommodate the line of the boat. Care is needed here: the old rule of "measure twice and cut once" applies and you need to work out carefully how to align the bolt holes that need to be drilled through the gunwales and seat frame to accurately match the pre-drilled holes in the seat hangers. It isn't difficult but it does require a bit of thought to formulate a plan before proceeding. Tools required are a saw, a tin of marine varnish, a drill with a 1/8" bit (for drilling pilot holes), a 1/4" bit for the bolt holes, an accurate tape measure, a steel ruler, pencil, cross-head screwdriver and a 10mm ring spanner. All existing nuts, bolts and washers can be utilised. The first job was to remove the yoke and use the leading edge bolt holes of the former seat position to refit the yoke behind the new seat. As the yoke was conveniently fitted at the centre point of the boat, I had elected to use the holes in the gunwales for the leading edge of the seat hangers. This would put the seat for kneeling and sitting around 4" astern of the centre point, which seems a good starting point. After sawing carefully-measured equal lengths from each of the leading and trailing edges of the new seat frame (I repeat: measure twice and cut once! ), I sealed the ends with varnish to protect the wood from staining and ultimately rotting. When the varnish had dried I attached the hangers and fitted the new seat to the gunwales. The new paddling position is a great improvement and the boat has a much better trim on the water. I'm not sure that I will keep the yoke, I might replace it with a thwart purely from an aesthetics point of view. The only downside of fitting the new seat is that there are now two more holes through the gunwales that serve no purpose and are visually unattractive, although I have put bolts through them to slightly improve things! 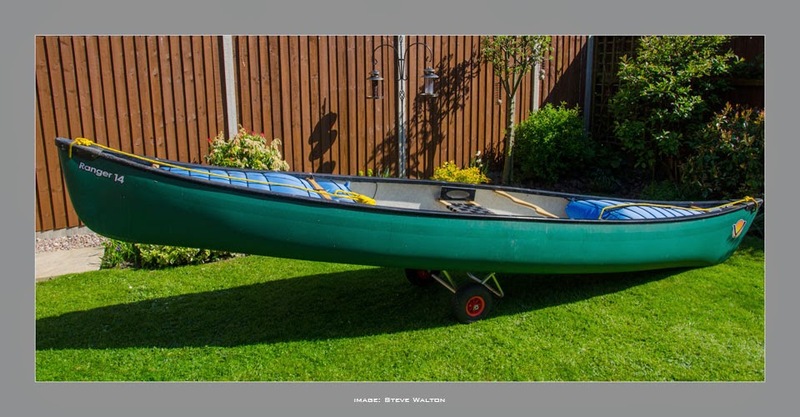 Overall, I'm very pleased with the Venture Canoes Ranger 14, it makes a reasonable solo canoe with moderate moving water capability, has some load carrying capacity and is stable if a little heavy. 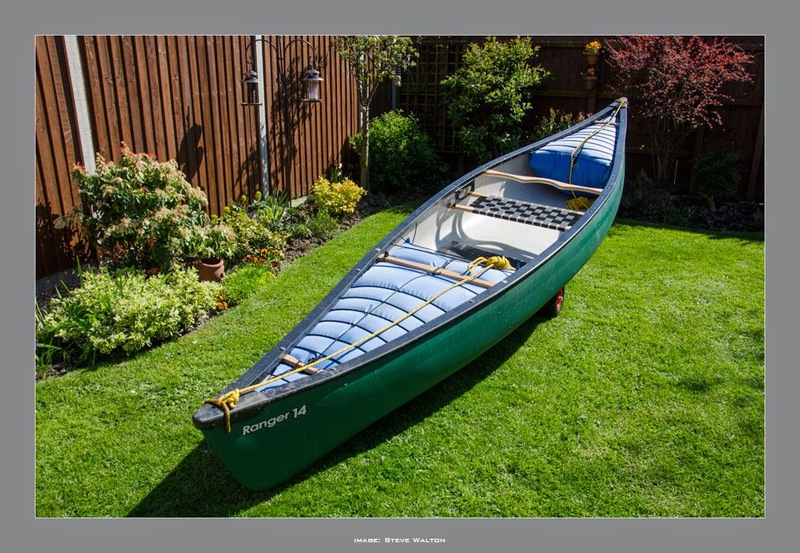 The polyethylene construction means it will take some knocks without breaking and, in the world of open canoeing, is something of a bargain. It will surf a wave and turn with reasonable grace, above all it will get you on the water and paddling!